However, it was sooo much freaking fun. Kimmy has impeccable taste and decorated in all my wedding themed ideas. She put the perfect spin of southern class in the party and it was incredible. The menu was to die for... salmon and prime rib with delicious carrots and asparagus with the most tasty sauces I've ever had. 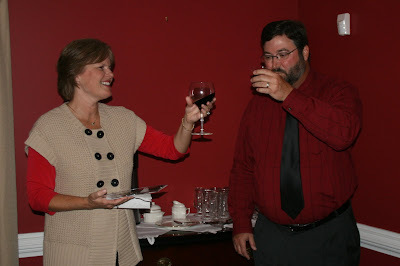 There were countless wine options and cheese platters, individually wrapped gourmet chocolates, and even a coffee bar! The silverware was put into mason jars and randomly throughout the house were mason jars with votive candles in them. Surrounding the mason jars, she placed big magnolia leaves and it was GORGEOUS. I think I found my centerpiece! I don't even need magnolia blooms... just the leaves with the lit mason jars was so simple and elegant. I adored it all! The walkway leading to the house was lined with mason jars with lit candles in them and it was such a nice way to welcome the guests. She also made floral arrangements in large mason jars with small pink roses. One of the arrangements was all rose buds and they were so beautiful! Among all that we had several pictures of AJR and I in rustic frames and it really tied it all together. Eeee, I am getting all giddy thinking about it! Our friends were also contributors to the amount of fun that was had this weekend. Saturday morning several of us got up at 6am and kicked off the weekend with an 8K race to benefit organ donation. It was a blast! All day we hung out and the guys went to a shooting range after watching college football at a bar. Meanwhile, Sarah (my roomie/Maid of Honor) and I hung out at home and tried to prepare for the night. After the party all my friends and I went to a place downtown for some dancing and more drinking. It was an awesome celebration and it couldn't have gone better. Sunday morning we all woke up to a breakfast casserole and recapping the night together. Gah, okay I shall stop gushing about my incredible weekend, but I am all smiles on this Monday back to reality. 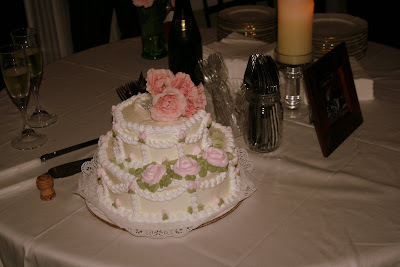 This is the cake that Kimmy had made for us... it was so pretty! She put fresh flowers on top and it was so fun cutting the cake together for the first time. (Good practice for the wedding ;) Take note of the silverware in Mason jars. P.S. The silverware was actually plasticware that looked like silverware. I am taking this idea with me to the wedding thank you very much! This is AJR and I about to start filling our plates up. I just like it because we look so happy! 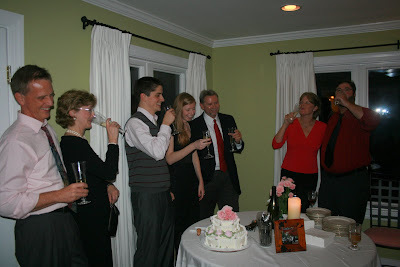 This is my Dad making a toast before the cutting of the cake. I love this picture because the similarity between AJR and his dad is so noteworthy. Here is my Mom and step-dad, Vince. 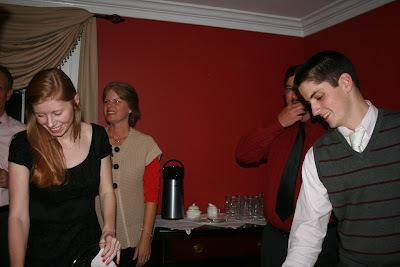 He made the first toast of the night and it made everyone say "aw".